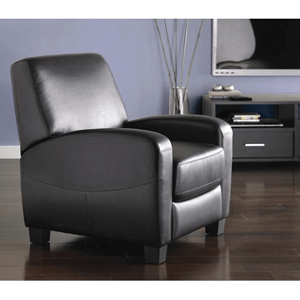 Add some functional style to your space with the Mainstays Home Theater Recliner. Transform your space with the Better Homes and Gardens Nailhead Leather Recliner (Multiple Colors). The Better Homes and Gardens Tufted Pushback Recliner will enhance the decor of any room with its elegant design. This Is Our Recliner Accent Chair Which Is Upholstered With Durable Top-Grain Leather That Will Accentuate The Decor Of Any Room It's Added To. Relax with power using the ultra plush adjustable recliner. Draped in smooth microfiber, this recliner features wide seating and arm rest for maximum support and comfort. Select the perfect position and enjoy your favorite movie in your living or entertainment room. Available colors include saddle, beige, chocolate or sage.Size: 35 In. x 35 In. x 41 In. (H).